This can be a stressful moment in many peoples’ lives because there are many options that you can take, but each of those options have clear pros and cons. 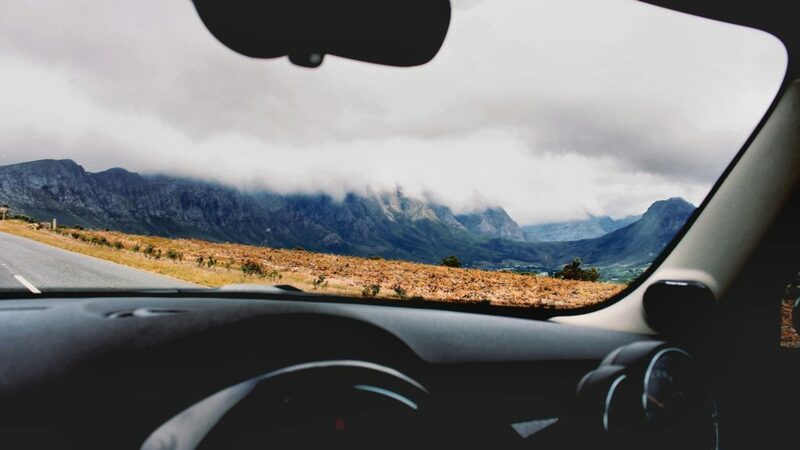 For example, a payday loan offers cash for an immediate need, but the interest rate is often so debilitating that it can lead one down the cycle where it feels that you are robbing Peter to pay Paul. In this article, I would like to provide a complete guide to debt settlement where I provide an overview of the process, the pros and cons, the common questions we receive, and other information that we hope will be helpful to help you make an informed decision about the best option for you. Debt Settlement: An individual or service working on an individual’s behalf to negotiate your debts lower than what is owed because an individual is unable to afford his/her debt. Create an enrollee-owned escrow bank account for the enrollee to consolidate all of the payments into one payment for the creditors. Communicate with the creditors to be the primary point of contact going forward to prevent future debt collections calls to the enrollee. Negotiate on behalf of the enrollee with each of the creditors for the lowest possible rate based on financial hardship. Get agreement from the enrollee on whether to accept the settlement and payment plan. Manage all of the payments to the creditors until the debt has been completely resolved. When choosing a debt settlement company, it’s important to observe the fees charged and compare those against other companies, how the fees are paid, and any other fees associated with the program. It’s also important to understand the end-to-end process of how the program works and who you will be interacting with throughout the program. For example, some companies pair will pair you with a specific advisor for the duration of the program while others will have you contact customer service once you enroll. The three most common alternatives to debt settlement are debt consolidation, debt management and bankruptcy. We have articles for debt management vs debt settlement, debt settlement vs. bankruptcy and debt consolidation, but we will highlight some of the differences here. Debt Management vs Debt Settlement: Debt Management companies work as an intermediary between the individuals owing the debt and the creditor. The enrollee generally deposits money into an account managed by the debt management company, which is then used to fund the creditors over a specific period of time, generally between 3-5 years. This period is inflexible as the creditor generally sets a maximum time limit for the debt to be resolved. The debt management company will do the following for the enrolled participant. 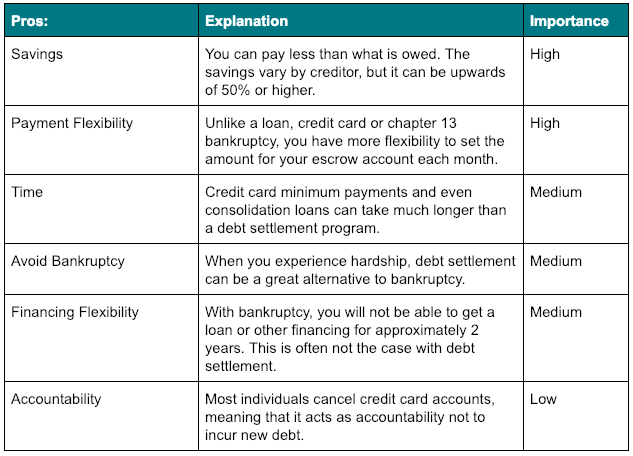 Debt Settlement vs. Bankruptcy: There are two main types of bankruptcy: Chapter 7 and Chapter 13 with the main difference between Chapter 7 and Chapter 13 bankruptcies is that all your debt is wiped out in Chapter 7 regardless of what you owe. For reference, student loans are generally not discharged in either type of bankruptcy. Chapter 7: To qualify for Chapter 7, you must meet income guidelines based on means testing. This information is determined by the Census Bureau and the Internal Revenue Service. These income guidelines are based on the income based on your family size and the state where you reside. For details, the most recent Census Bureau Median Family Income By Family Size for November 1, 2018 and beyond can be found here. If you earn more than the median, the next step would be to determine whether you have enough left over to repay some of your debt. Chapter 13: Chapter 13 is another way to get rid of your outstanding debt, but it takes much more time and is more involved. Since a Chapter 7 bankruptcy can be completed in under 1 year, a Chapter 13 bankruptcy can take up to five years. There are also limits as to how much debt you can include. When you file a Chapter 13 bankruptcy, it can be similar to a structured settlement plan in a debt settlement in that you have to pay some or all of your debts. The amount that you pay typically depends on the type of debts included in the bankruptcy and how much you owe to your creditors. There is also a waterfall of payment priority with the first payments made to your lawyer(s) and the lowest priority to your unsecured creditors. 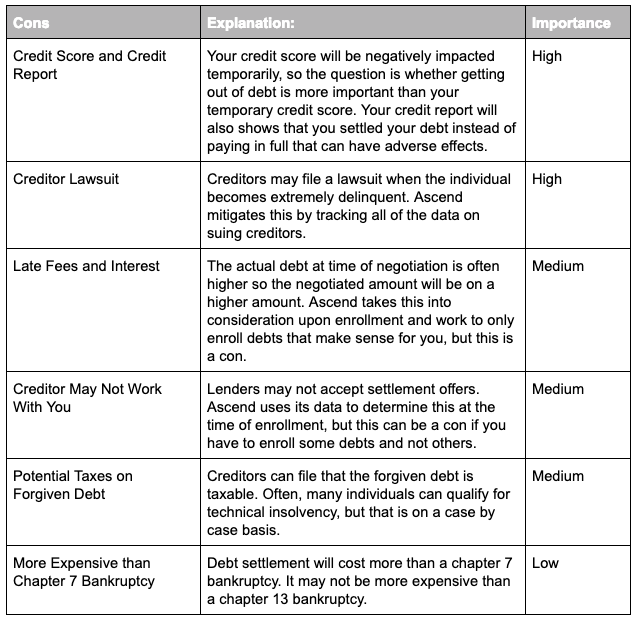 How can Debt Settlement affect your credit score? The Debt Settlement company’s goal is to assist you to get out of debt as quickly as possible with minimal impact to your Credit Score. There are multiple factors that determine the exact impact a debt relief program will have on your Credit Score, so the exact impact will be difficult calculate. However, it would be safe to assume that any debt relief or debt settlement program will likely affect your credit score negatively. Debt Settlement is a great avenue if in the short term you are more interested in getting out of debt than maintaining your credit score and if you’d prefer not to file bankruptcy and would like to rebuild your credit once you are out of debt. How much do Debt Settlement companies charge for their fees? Debt Settlement Fees: Many companies will charge fees based on the amount of debt that you enrolled in the program. This can vary from company to company, so it’s important to have a clear picture of the fees before enrolling in a program. It’s also important that you choose a debt settlement company that does not charge fees until AFTER the first debt has been resolved. Bank Account Fees: There is often a bank account fee for setup and a monthly ongoing fee. The monthly fee can be between $7-$15 per month, depending on what services are provided. Other Fees: Be cautious on any other fee that is being charged. If you are being charged other fees, you may want to look at another debt settlement company as the fees should be simple, straightforward, and understandable. Will debt collectors still contact me if I enroll in a debt settlement program? The short answer is “no” if the debt settlement company is doing its job right. The debt settlement company should send a power of attorney form to your creditors to have all of the calls and future contact directed to the debt settlement company. How is Debt Settlement different than Debt Consolidation? The main difference is that a debt consolidation often refers to a debt consolidation loan which is new debt to repay existing debt and debt settlement is where you pay off your creditor when you are unable to afford your debt anymore. It is not a loan. We built a comparison tool to help show the differences between the two options. We also wrote an entire article on the pros and cons of debt consolidation. It’s possible. The IRS does consider forgiven debt as taxable income, but the IRS Form 982 may exempt you from this tax. This is something that you can talk with a tax advisors about to know how debt relief may impact you. Can I negotiate on my own? Absolutely. We’ll even walk you through this process during a call This can be the most inexpensive option. There are cons such as managing creditors, managing payments, preventing lawsuits, speaking with creditors, etc., but this is the most inexpensive option. Will I be sued by a creditor? Creditors may send the debts to collections agencies and/or law firms to collect your debt. When research debt settlement companies, it’s important to ask the question how they prioritize your debt. For example, the debt settlement company should have a robust strategy to help prevent lawsuits. Do additional fees and/or interest accrued on my debt when it goes delinquent? Creditors generally continue to add interest and late fees onto your delinquent balances until the point of charge off. This means your balance may increase until your account is in settlement. As such, a debt settlement company should request your APR and the type of credit up front to forecast how the balances will change over time and how to minimize your total costs when determining your negotiation and payment strategy. This depends on each situation and each individual. 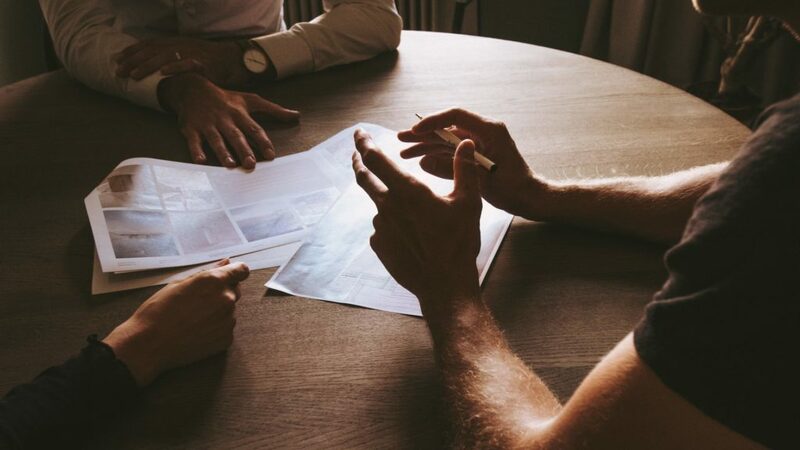 We need to know your exact situation before making a specific recommendation as we do consider that debt settlement as viable option for some, but not for others. Feel free to take the short 4-question form if you are interested to have an analyst look at your situation.